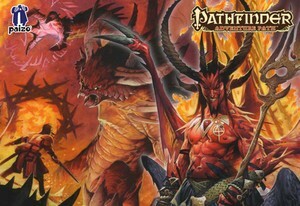 The "Breaking the bones of Hell" SoundPack gives you the complete audio solution when playing the final chapter of Pathfinder's "Hell's Rebels" Adventure Path. All the preparation is done for you, and every sound you'll need is right at your fingertips. With the Kintargo Contract recovered and alliances in place, the Silver City and the surrounding region of Ravounel is shielded from Chelish invasion. Yet as Kintargo's heroes ready treaties to secure the area's independence, enemies made in the liberation effort remain active. Worse, the onetime despotic ruler of Kintargo, Barzillai Thrune, lives on in Hell, and his plans have only been slowed. Strange manifestations and infernal hauntings throughout Kintargo reveal the truth—that the inquisitor's death has only empowered him, and the secret to stopping him hides in Hell's depths! Can Kintargo's heroes brave the Pit to forever save the city from Barzillai Thrune. This SoundPack includes samples recorded by Pathfinder fans and players at both PaizoCon 2016 and GenCon 2016. Syrinscape thanks you and praises you for your spectacularly and slightly disturbing contributions!